Here is the allium that I mentioned in an earlier newsletter, voted a Perennial of the Year for 2018. 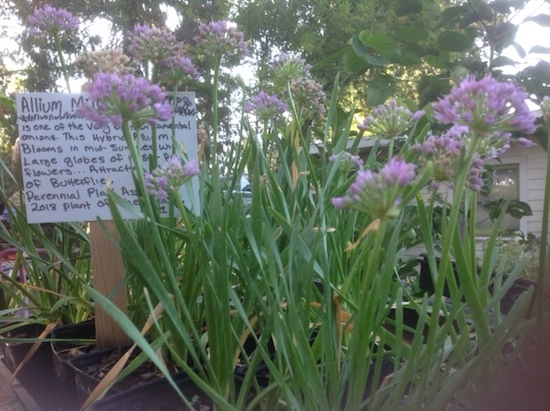 The 2-inch purple ball clusters form from mid to late summer on this ornamental onion and are attractive to butterflies. The clumps are compact and upright. It is easy to grow in a sunny location and likes it on the dry side. Best if mixed with other perennials to hide withering greens at bloom time. They prefer normal to sandy soil conditions and are not particular about the pH. They are on the deer resistant list and make good cut flowers fresh or dried. We grew them in 4” pots and they are $1.00 off this month. I somehow double ordered this tree this year and thought it would be a good deal to promote it. This tree originally came from mountainous areas of Europe and Western Asia. This variety has naturalized in North America. It grows 20-40 feet tall and 15-25 feet wide. Foliage is fine cut and fern-like, turning golden to reddish in the fall. 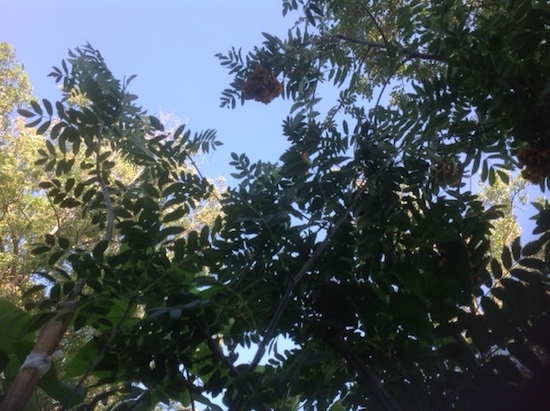 They produce hanging clusters of berries that turn an orange-red from the flat clusters of white blossoms in spring. Birds will forage on them. They do like a well-drained soil and will grow in sun to light shade. They do not get too big and make a nice small garden tree (to give some relief to your other plants). Regular price is $59. Get them for $39 this month. 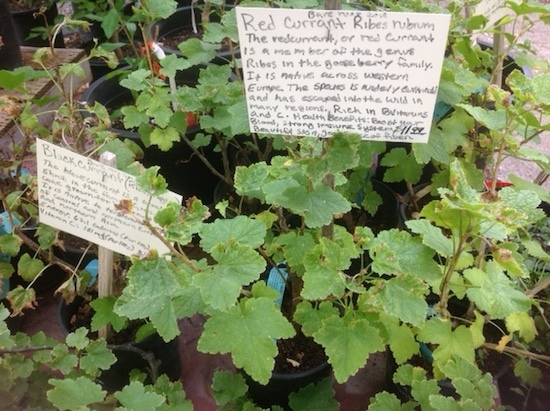 Currants are a many stemmed deciduous shrub. Consider growing them as an edible hedge, especially for those of you who will not plant anything that cannot be eaten. They bloom in spring with drooping clusters off-white flowers. The fruit of black currants can be dried like raisins or both red and black are used in preserves. The foliage usually has nice fall color. Currants like a little shade here with regular water. Mulch well. Prune when dormant. Cut older than 2-year canes on the blacks to the ground and older than 3-year canes to the ground on the reds. Currants are available in one gal. and are half off this month. Hard to believe we are in August already. Our children will be returning to school. Fall sports begin. ‘Summer’ is winding down although we still have plenty of hot, dry, fire-prone days ahead. Time to start thinking about fall gardening. Start your seeds this month if you are going that route. Here is a partial list of some of the things you can grow from seed to transplant out next month. For vegetables, you have all the brassica family. What is that you say? I am referring to broccoli, cabbage, kale, brussels sprouts, cauliflower and their relatives. You know the ones. In addition, you can grow carrots, chard, beets, peas, greens, lettuce, spinach, onions and radishes, although you might wait for the end of the month to plant straight into the ground. I find I have to bird net my cool season vegetables or I am just feeding the birds with not much left for myself. We are also beginning to stock starter plants of these popular vegetables. Onion sets, potatoes, and garlic have been ordered and we hope to get them in mid-September. Herbs like cilantro, arugula, chives, and parsley can be planted now too. We just put in a seed order to re-stock for fall. Vegetables are not the only thing you can plant from seed now. Cool season, winter and early spring flowers like calendula, cerinthe, bachelor buttons, forget-me-nots, larkspur, love-in-a-mist, pansies, violas, poppies, snapdragons and sweet peas can be planted in fall for winter and early spring blossoms. Iris bulbs arrive at the end of this month. If you need to divide your iris now is the time and have them re-planted before September is done. Fall bulbs like daffodils and tulips will not be arriving till mid-September here. August and early September are a great month for feeding roses, all flowers, fruit trees, and vegetables. Keep your investment going strong for the next several months. Many plants look tired from summer but recover to perform better in the coming months. Removing spent flowers or cutting back things like petunias will give them a whole second life. Rose blooms, which do not last long in 100-degree weather, start looking good again. We use the EB Stone Rose and Flower food with great results on all things flowering, including our crape myrtles and rose of sharons. Speaking of which, both the crapes and rose of sharon, hibiscus are blooming now, along with the hardy hibiscus. 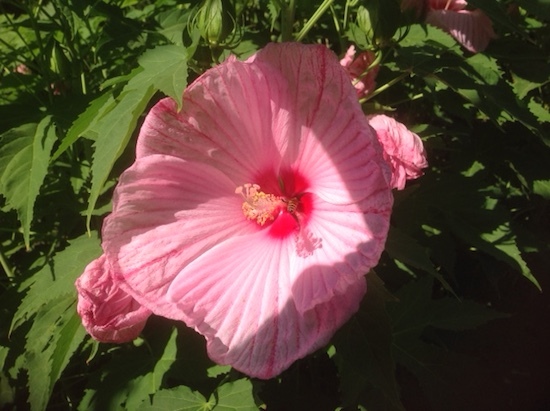 Hardy hibiscus is an herbaceous perennial (dies to the ground in winter) with super big flowers. 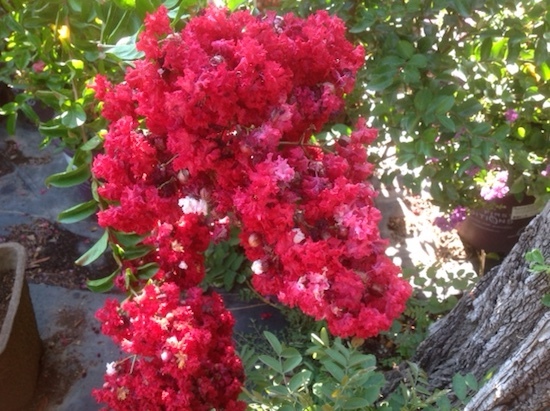 The flowers only last a day but established plants can put out blooms for 4-6 weeks. They can also be used as a pond plant. Most of you have seen the one in our pond here. It is loaded with flowers right now. 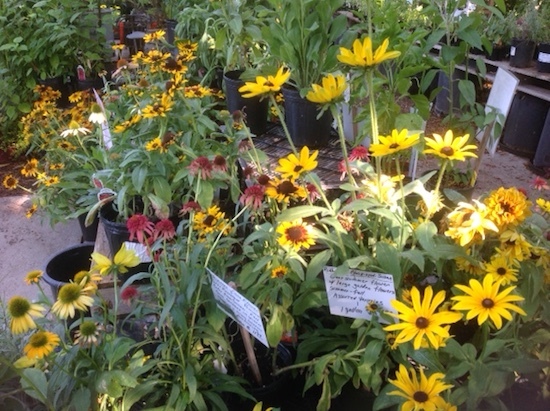 Some of the best perennials for color this time of year are coreopsis, rudbeckias, echinaceas, and gailladias. These hardy perennials are fairly easy to grow, attract bees and butterflies, bloom over a long period and make good cut flowers. But who wants to even be out in this heat? Feel like it is sucking you dry? How do you think your plants feel? Many are probably telling you how they feel by their looks. Heat and sun-stressed. Consider moving containers into a shadier spot. Can’t move it? How about a little shade cloth or an umbrella? Make sure they are getting deep watering which is almost impossible to do if you are hand watering plants in the ground. Young transplants at this time of year in full sun will need water twice a day. All other new plants once a day through the worst of the heat and sun. Hanging baskets and above ground containers dry out faster than in-ground planting. This includes ‘drought resistant’ plants. Plants need to be established before they can withstand the kind of heat we are having and survive with occasional water. A good 2-3 inch layer of mulch around the base of your plants will help too. Plant more trees. Try to get all areas of your yard where they get shade for part of the day. This will help in the long run. Trees add value to your landscape, provide habitat for wildlife, bring down the surrounding temperature, and add oxygen and beauty to your environment. We have a nice selection of shade trees at the nursery. Some are on special this month. We are stocked up on our lanterns, buddhas, terracotta and glazed pots. The only thing missing are large water bowls and that might not be till next spring. Did everyone get the notice that we decided to stay open on Wednesdays? So, for the time being, we are staying open 7 days a week 9-5. That can change and will for sure come the rainy season and winter hours.